I can’t believe it has been a week since I started this post thread. Seven doodles later, we are 1/52 of the way into this endeavor! 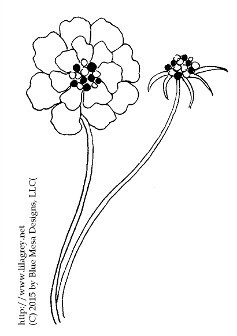 Today’s doodle was inspired by a delicate light purple bloom in my garden. It is mid-November here in Colorado, we have already had a few frosts and are expecting several inches of snow tonight. Most of the garden is now brown, some of it trimmed back for the season. However, this little flower does not know winter is here and continues to grace my flower bed with its beauty. I think this little drawing would look beautiful on the side of a journal page. Perhaps I would decorate it with a quick watercolor wash to add a bit of color, just like the flower did for my garden.